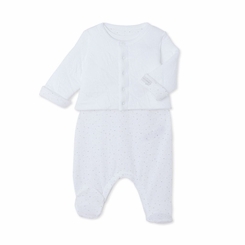 This unisex baby set includes two stylish yet practical pieces: a reversible quilted tube cotton cardigan and a sleeveless tube cotton sleepsuit with a shooting star print. This baby set features refined details: the reverse of the cardigan adopts the sleepsuit's all-over print, while the foot soles are also printed. The numerous poppa openings are extremely practical for dressing baby girls or boys more easily. An essential baby set, perfect for everyday wear.